Thanks to years of educating and organizing, single payer has moved one more notch up the scale of the possible. Friends of the insurance and pharma industries are done ignoring us or even mocking us. As Medicare for All grows in popularity, they are now fighting back. 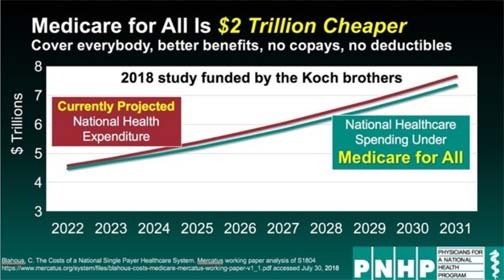 Yesterday, a Koch Brothers-funded think tank called the Mercatus Center released an analysis of Sen. Bernie Sanders’ Medicare for All bill. It tried to make the case that single payer would bankrupt the U.S. government, but even its flawed assumptions show that single payer would save trillions in the long run. What I found most interesting about the study is that it hangs essentially the same price tag on Medicare for All that the left-leaning Urban Institute did two years ago: about $32 trillion over 10 years. But instead of screaming about how Medicare for all would sink the economy, many journalists and commentators noticed that covering everyone in America — with a full range of benefits, for less than what we pay now — is actually a pretty great deal! The Intercept: Koch-backed think tank finds that “Medicare for All” would cut health care spending and raise wages. Whoops. That’s no accident. This change of heart is a direct result of the increased organizing and education efforts from single-payer activists like you. • Mercatus assumes Sen. Sanders’ plan would reduce administrative overhead to 6 percent of total health spending, but that estimate is erroneously based on Medicare’s current overhead, which includes the wasteful and expensive private Medicare “Advantage” plans. Traditional Medicare overhead is less than 3 percent, but Sen. Sanders’ proposal would reduce administrative costs to Canada’s level of 1.8 percent by eliminating wasteful fee-for-service billing schemes and funding hospitals through global budgets — lump sums that cover operating expenses, similar to the way fire departments are paid. Compared to Mercatus’ 6 percent estimate, cutting overhead to below 2 percent would save an additional $2.9 trillion over 10 years. • Mercatus ignores the fact that Sanders’ plan would save doctors and hospitals about $3.4 trillion over 10 years, plus an additional $2 trillion in savings to other providers such as nursing homes and home care agencies. Today, U.S. hospitals spend one-quarter of their total budgets on billing and administration, more than twice as much as hospitals in Canada and Scotland. American physicians, who must bill hundreds of different insurance plans, spend two to three times as much as our Canadian colleagues on billing. • In total, the Mercatus analysis underestimates administrative savings by about $8.3 trillion over 10 years. • Mercatus also ignores the massive savings from negotiating drug prices. Countries with national health plans (and our own VA system) spend about half of what the U.S. does on medicine. Negotiating drug costs would save at least $1.7 trillion more than Mercatus’ prediction over 10 years. As a physician, I am particularly disturbed by Mercatus’ dire warning about the costs of covering the uninsured, given that an estimated 36,000 Americans die prematurely each year because they lack insurance. But if cost is the only concern, just remember that in 1966, when millions of seniors gained new coverage under Medicare, there was zero increase in the total number of doctor visits and no waiting lists at hospitals; just a reduction in unneeded elective care by wealthier patients, and more care to sick people who needed it. Despite leaving trillions of dollars in savings out of the equation, Mercatus concludes that Medicare for all would cover medically necessary care for everyone in America with a net increase of only $17 billion in 2022, equivalent to a one-third of one percent (0.33%) increase in national health spending. To put that in perspective, national health care spending is expected to climb more than 5 percent this year alone. Rather than increase expenditures, single payer would essentially shift spending from private to public sources and from local governments to the federal government, freeing families, businesses and struggling communities from the crushing (and unpredictable) costs imposed by private insurance companies. The Mercatus Center tried to make the case that the richest country in the history of humankind can’t afford universal health coverage. But they proved once again that by shifting our current spending to a rational, streamlined single-payer system, we can easily afford to cover everyone. As Medicare for all moves from the margins to the mainstream, opponents of single payer will fight us even harder. Please continue organizing and advocating for single-payer reform, and consider making a tax-deductible donation to PNHP so that we can strengthen our collective efforts for the struggle ahead.